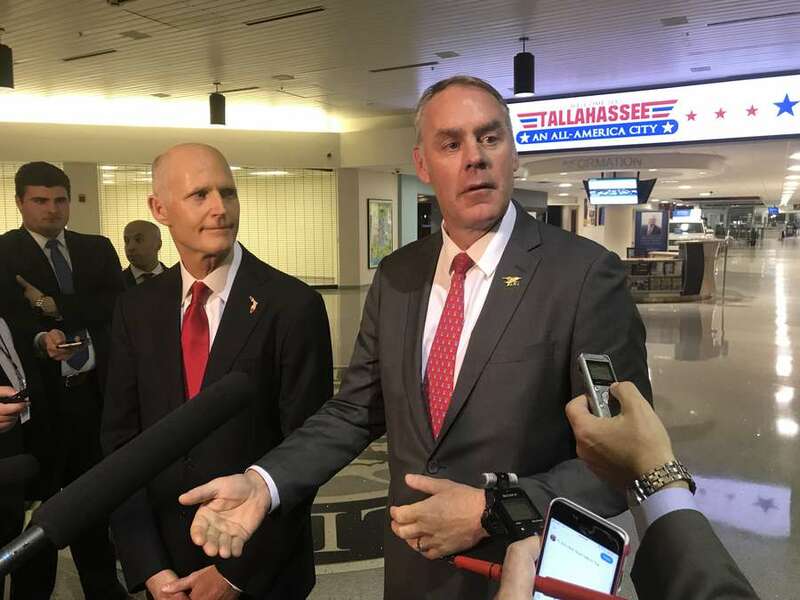 A hastily-arranged airport rendezvous Tuesday ended with an announcement from President Donald Trump's administration that the state of Florida is "off the table" for new offshore oil drilling, a declaration that brought both relief and protests of election-year politics. Florida Gov. Rick Scott met with U.S. Interior Secretary Ryan Zinke at the airport in Tallahassee Tuesday afternoon. Both men emerged 20 minutes later to face waiting reporters, who had an hour's notice of the meeting. 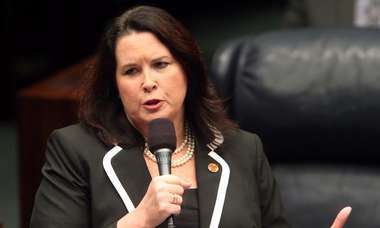 "As a result of our interest in making sure that there's no drilling here, Florida will be taken off the table," Scott said. Zinke said the decision was a culmination of multiple meetings between Scott and Trump administration officials. "Florida is obviously unique," Zinke said. "For Floridians, we are not drilling off the coast of Florida, and clearly the governor has expressed that it's important." The airport meeting came five days after the Trump administration made the controversial announcement that it would open a massive area to offshore oil exploration. Four days before the drilling announcement, Scott and Trump had a New Year's Eve lunch at Mar-a-Lago, the president's estate in Palm Beach. Thursday's drilling declaration immediately brought howls of protest from governors as far north as New Jersey and included Scott, a Trump supporter who is strongly considering running for the U.S. Senate this year against Democratic Sen. Bill Nelson. In a statement Tuesday, Nelson acknowledged the obvious political implications of Tuesday's announcement. He called it a "political stunt." "I have spent my entire life fighting to keep oil rigs away from our coasts. But now, suddenly, Secretary Zinke announces plans to drill off Florida's coast and four days later agrees to 'take Florida off the table?' I don't believe it,' Nelson said. "This is a political stunt orchestrated by the Trump administration to help Rick Scott, who has wanted to drill off Florida's coast his entire career. We shouldn't be playing politics with the future of Florida." Zinke cited coastal damage from Hurricane Irma in September and the ongoing problems with pollution around Lake Okeechobee as factors in the administration's decision, which comes at the start of what is certain to be a raucous and volatile election year in Florida. A former member of Congress from Montana, Zinke said Scott's lobbying was central to the decision, and he gave what sounded like an endorsement of the two-term governor. "You have a tremendous governor," Zinke said. "He says exactly what he means. Florida is well-served." Scott, a Republican, is entering his eighth and final year as governor, and as he ponders a possible U.S. Senate candidacy, he's making the environment a top priority. Scott's proposed budget includes hundreds of millions of dollars for Everglades restoration, park improvements and springs protection, and he has personally lobbied President Trump for federal money to make repairs to the long-neglected Herbert Hoover Dike at Lake Okeechobee. Scott was vilified by environmentalists in his first term for proposing profit-making ventures in award-winning state parks and budget cuts in the Department of Environmental Protection and at the state's five regional water management districts. Asked why it makes sense for the federal government to prohibit drilling off the coast of Pensacola but to permit it 20 miles away off the coast of Alabama, Zinke said: "Because the great state of Florida has expressed, and the governor has expressed, a desire not to drill." As Scott and Zinke ended a seven-minute press conference, reporters asked whether politics played any part in Tuesday's announcement, but the two kept walking and there was no response. Shortly after the drilling announcement last week, Scott tweeted that he was seeking a meeting as soon as possible with Zinke, citing "the crucial need to remove Florida from consideration" — which is what appeared to happen Tuesday. The Interior Department's Bureau of Ocean and Energy Management (BOEM) distributed information to congressional staff members this week that showed that of every coastal state that was asked to submit official comments on the drilling proposal in July, Florida was the only state that expressed "no position." Scott's office on Tuesday produced an Aug. 17 letter from the state DEP expressing its concerns about "safety and environmental protection" surrounding any oil and gas exploration. But the letter did not expressly oppose the drilling proposal. Scott's Department of State, which manages historical resources, also sent a letter that said the agency had "concerns about potential adverse impacts to significant archaeological resources," but also did not register opposition. Florida's long, fragile coastline and ecosystem has always made drilling "the third rail" of politics in the Sunshine State — an issue lethal to anyone who supports it. As drafted, the new five-year drilling plan could open new areas of oil and gas exploration off the East Coast from Florida to Maine, where drilling has been blocked for decades. Dozens of environmental groups denounced the proposal. Had Tuesday's Florida declaration not happened, Scott could have been forced to endure campaign TV ads showing monstrous oil derricks and drilling platforms superimposed over the pristine emerald green beaches of Panama City and Destin — an area critical to Scott's political fate. Offshore drilling was the cause of one of the most catastrophic environmental disasters in U.S. history, the 2010 Deepwater Horizon oil spill in the Gulf of Mexico off the Louisiana coast. Late Tuesday, Scott's office issued a press release headlined: "Gov. Scott fought to protect Florida's coastline."